This collection of vegetarian and vegetable curry recipes from around the world includes Thai vegan curries, Indian vegetable curry, and some non-traditional vegetarian and vegan curry recipes. Vegetarian curries can be eaten plain just as they are, though they are usually served with rice or a flatbread like a naan. For a nutritional boost, pair your homemade vegetable curry with a healthy whole grain such as quinoa, millet, or even brown rice instead of white. If you want to expand beyond curries and into other international cuisines, use this guide to vegetarian recipes from around the world, including Japanese, Thai, Mexican food, and more! With Indian origins, Chinese five-spice powder, and an earthy sweet taste, Massaman curry is a truly global dish. This vegetarian version of Massaman curry is a simplified version of the traditionally complex curry but still has a distinct kick. Traditional Massaman curry ingredients are chicken and potatoes, which is why this vegetarian version uses seitan, but if you want to add veggies, try baby corn or green peas. 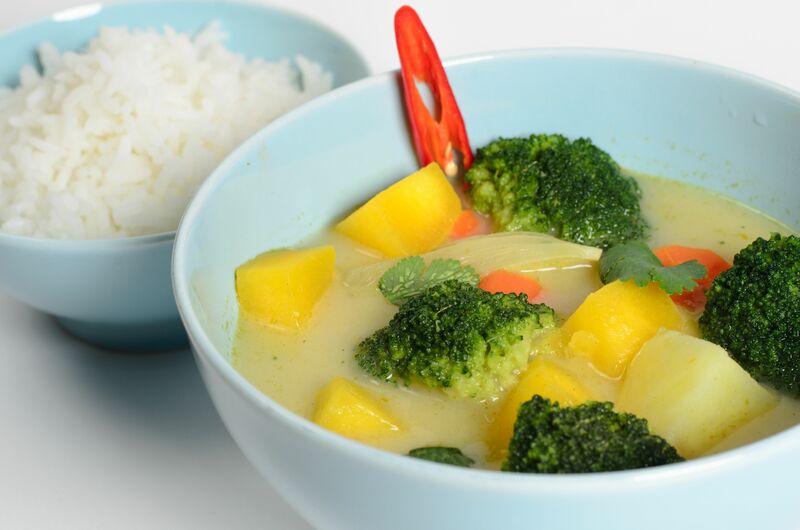 Make an easy homemade yellow Thai vegan curry with coconut milk, curry powder, turmeric, and ginger. Though this recipe calls for potatoes, broccoli, and cauliflower, just about any type of vegetable could easily be substituted, as is the case with most vegetable curry recipes. The vegetable curries of Thailand have such a unique taste. It's the blend of several spices in a curry paste that lends each curry, whether green, yellow, or red, their burst of memorable flavor. This recipe uses a store-bought green curry paste, chopped vegetarian chicken substitute (though you could use tofu, seitan, or just more vegetables), and is topped off with fresh cilantro for a final layer of flavor. This tofu tikka masala rounds out the list of vegan curries from around the world since it originates in the U.K. and not India. It's true. Chicken tikka masala is a British dish, and not native to India at all. This version is made with marinated and baked tofu instead of chicken. A variety of veggies are simmered in a quick homemade green chili paste and a variety of spices, including cumin and curry. This is a less saucy curry heavy on the vegetables, so it would be appropriate as either a side dish or an entree. If you're the type of person who usually doesn't like to eat your veggies, this vegan recipe just might change your mind about that. No collection of vegetarian curry recipes would be complete without the addition of at least one Japanese-style curry. This recipe is for a Japanese eggplant curry, though you could also try adding a bit of seitan as a meat substitute or try adding some Japanese udon noodles for a full meal. Use a store-bought vegetarian red Thai curry paste to make this simple yet delicious red Thai coconut curry with tofu, carrots, and spicy Thai chilies. Or, if you like Thai red curries, try this vegan red curry recipe with fresh chopped basil and baby corn. Add some veggies, spices, curry powder, and a bit of water to your crockpot or slow cooker, turn it on, and that's it. You've got a simple vegetarian Indian-style curried veggie side dish a few hours later. If you like Indian-style curried veggies, you might also want to try this Indian curried chickpeas recipe. Thai Curry Chicken: Best Recipes Ever! How Do You Make a Solid Thai Massaman Curry Paste?